Aquarius Apartments & Cabins are located in picturesque Mildura and are providers of luxury accommodation within Sunraysia. Aquarius Apartments & Cabins offers a variety of accommodation from Executive Cabins through to fully self-contained Three Bedroom Apartments. Whether it’s an overnight stay, weekend escape or family holiday, Aquarius offers that ‘extra something’. Enjoy luxury living in a relaxing environment that is well suited to both holiday makers and professional people. Superbly located only minutes from Mildura’s CBD and opposite the large shopping centre Mildura Central as well as the Gateway Tavern. 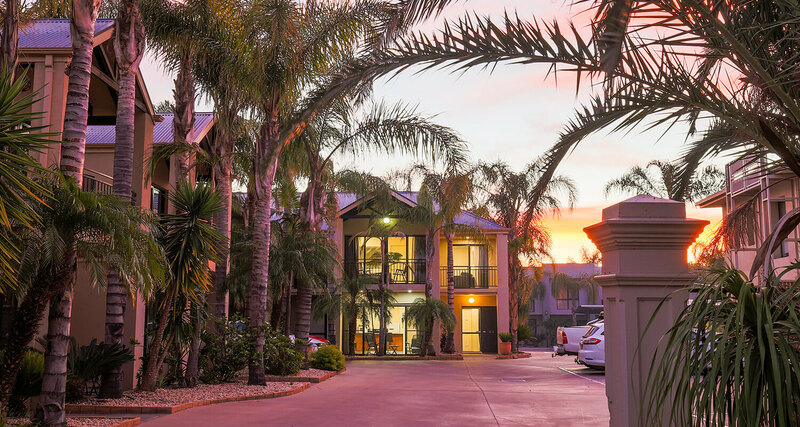 You have the added bonus of being able to utilize all of the recreational facilities onsite including barbecues, gym, large playground, games room and our huge 16 metre indoor heated pool. Relax and unwind in our luxury Spa Apartments perfect for that weekend escape with a loved one. Featuring a king bed, kitchen, European laundry, balcony and premium MOR amenities. Perfect for a family holiday with all the essentials of home. These apartments have a spacious lounge and dining area on the ground floor. Some of these Apartments can accommodate for families up to 6 people. Discover a weekend away with friends or family in our modern Two Bedroom Two Bathroom Apartments. Each Bedroom offering their own ensuite featuring the premium MOR amenities.